"Porgy and Bess” transcription by John Sheridan with Randy Reinhart, Allan Vache and Jim Cullum. 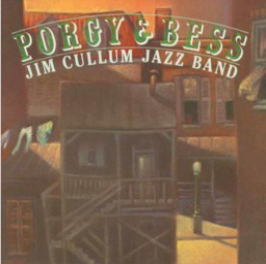 Bandleader and cornetist Jim Cullum says that performing George Gershwin’s opera Porgy and Bess as a jazz piece has been the highlight of his 50-year musical life. In performances on tour across the country, the Cullum band’s original jazz transcription of the Gershwin score has captured critical acclaim for its originality and for including virtually all the music from Gershwin’s folk opera. This 1992 performance at The Landing in San Antonio is unique among the many jazz interpretations of Porgy and Bess for its inclusion of the distinctive and highly personal narration by bass-baritone William Warfield, known for his definitive portrayals of Porgy playing opposite Leontyne Price in the 1950s; and in the completeness of the musical selections— there are 28 compositions on the double album, including the little-known pieces from Gershwin’s opera, Buzzard Song and Oh, Doctor Jesus; and for its electric live performance captured at The Landing in San Antonio by the Grammy award-winning audio team of Ed Greene, Jim Anderson and Malcolm Harper. The Dolby SR two-track recording from the audio truck on the night of performance had never been played back and was sourced for this recording. Every attempt was made by the audio team to preserve the warmth of the original analog recording in mastering and manufacturing the album. 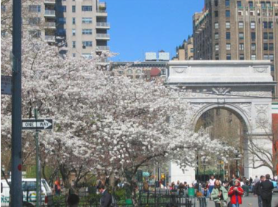 Those are famous lyrics, and yes, if you’re in New York in June when the weather is perfect you might take my advice and start a stroll at the foot of 5th Avenue, at the Washington Square Arch. The Arch is much like the Arc de Triomphe in Paris, except that it is smaller. It was built to celebrate the centennial of George Washington’s inauguration as President of the United States. Here you go. Bearing a bit to the southwest, heading diagonally across Washington Square, enjoy its many charms along the way: Numbers of old men play chess, sometimes with a few stragglers standing alongside, silently studying each move. There is a little dog park where people let their dogs sniff all around on the other dogs, and somehow there are no dog fights. Bocce balls are cast up and back over long greens. A few citizens nap in the sun. And of course, there are almost always a few lovers in embrace. Entering the cafe you will see the original tin ceiling and dark wood with little wooden statues and oil paintings that are quite dark, and a big old brass espresso machine that they do not use any more, and two-foot- square marble tables where customers must squeeze in even if it’s not crowded. 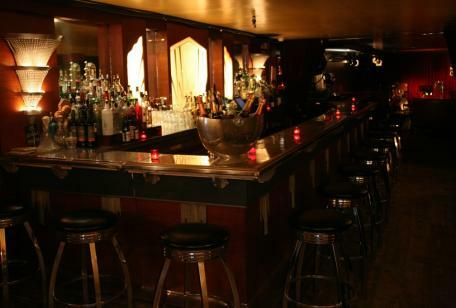 In the center of the back wall there is a table tucked in an alcove. To the side and above the table is a pay telephone. This is my table, and starting with my discovery of Caffe Reggio in 1980 and continuing to this day, this table and telephone have served as my New York office. If another customer gets there before I do, I wait it out. Eventually, my table comes open and I move in. But I don’t suffer while I wait, for Caffe Reggio never fails, and I go after some of the regular menu items — espresso coffee, Italian pastries, real chocolate frappés and other stuff. Often times however, I have been away from my New York office for as long as a couple of years. It was a coincidence that during one of those sabbaticals we began to work on our jazz band’s version of Porgy and Bess. John Sheridan was our principal arranger. This was in 1985 and 1986. Some of the band members looked on my Porgy and Bess plan with skepticism but work came along, and little by little as the whole thing emerged, it was magnificent. Porgy and Bess is probably the greatest single accomplishment of the band’s 48-year history. To my knowledge no one has ever performed a jazz version of the entire opera. We musically followed the passion, richness, sorrow, laughter, romance, and tragedy — all the moods of Porgy and Bess as they rose and fell. Various jazz band instruments took on character roles. On day one, I took my position at my office at the café and sipped coffee and leafed through the latest copy of Applause Magazine which contained a well-written story on George Gershwin, by Edward Jablonski. The article identified Edward Jablonski as the foremost Gershwin scholar/writer in the world. phone. Well, okay . . . . and I answer it. At 9:55 the next morning I am stepping out from a taxi and sizing up Edward Jablonski’s pad, a classic New York brownstone on the Upper Westside. He buzzes me in. The inside looks like a Gershwin museum with lots of memorabilia all over, including. I back out the door and head back to the Caffe Reggio where I order Bandleader Jim Cullum something, settle into my table, and having swung at and missed the first pitch, I start thinking....“What now?” The pay phone starts ringing. It keeps on! No one ever calls in on it. 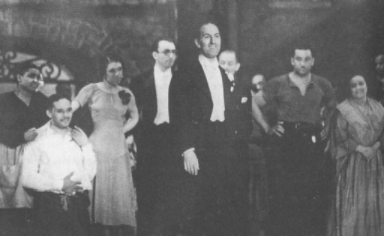 Caffe Reggio has its own framed photographs of Gershwin at the Alvin Theater with the full cast of Porgy and Bess taking bows on opening night in 1935. Gershwin’s water colors are lovingly displayed, and there is one water color of his sparse room at Charleston where he composed Porgy and Bess. His room there was hlghighted by a single light bulb that hung down on a single cord. He has faithfully painted it in.Edward Jablonski has already listened twice to our Porgy and Bess. He is knocked out by it. He is beaming. He does not let up, and has the energy and enthusiasm of John Henry the steel drivin’ man. I am wondering, “They say this guy is a recluse?” But he is speaking my language. “No,” she insists. “I’m gonna sell this Porgy and Bess to CBS Masterworks one way or the other,” and she pounds the little café table and sloshes the coffee. After another try at CBS I go back to Texas. “Leave it my hands,” she insists! 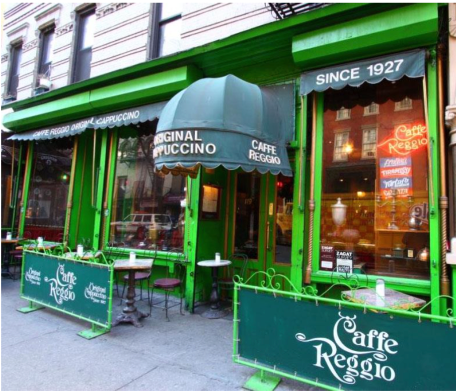 “No, I’ll meet you at Caffe Reggio,” she chuckles, for she is high on victory. The next afternoon I am there. “How did you do it,” I ask? “You know those Sony Walkman tape players they have these days? I bought a new Walkman and cued up a fresh cassette of Porgy and Bess, to that wailing clarinet cut on ‘My Man’s Gone Now.’ The President of CBS Masterworks is Joe Dash. I know his secretary. She tipped me off that he was leaving for Europe and that a limousine was picking him up at 12:00 noon, last Wednesday. At 11:30 I was up there in the foyer by the elevator. As he walked out I stopped him. 'Excuse me, Mr. Dash. 'Oh, Hi, Mary Beth, I’m in a rush,' he said. There is one constant. If you would like the finest cup of coffee, walk south across Washington Square to 119 MacDougal Street, 21⁄2 blocks below the Square to the west side of the street where you may step right into my office. Here nothing has changed. Same Caffe Reggio. Same table. Same pay phone. Same phone number. Photo courtesy Jim Cullum Jr.
20 Oh, I Can’t Sit Down! 5 What You Want Wid Bess? 24 Oh, Bess, Oh Where’s My Bess? Lou Caputo's “THE NOT SO BIG BAND” IS BACK IN ACTION AGAIN ! 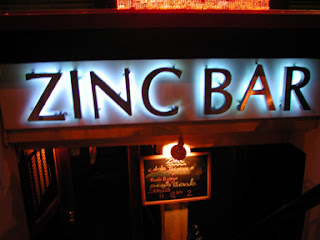 “Zinc Bar is a Greenwich Village jazz club in the former space of the legendary 1940s jazz venue Club Cinderella where Billie Holiday sang to the accompaniment of Thelonious Monk the house pianist. Uh Oh! is the latest installment in the recorded history of “The Not So Big Band”preceded by “Urban Still Life” and the follow up “Not So Big Band” Those project were co- produced by my great friend,mentor and jazz bassist Chris White (1936- 2014) who also performed and arranged music for those projects as well. We would like to dedicate this project to his memory. 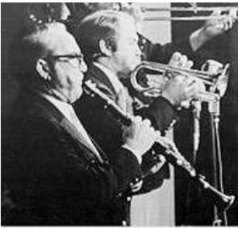 The “Not So Big Band” is the brainchild of talented multi-instrumentalist Lou Caputo.It is a big band that consists of twelve musicians as opposed to the sixteen-piece or larger variety. This band is a working band, playing together for over 10 years. The band has performed for over a decade at “The Garage” in Greenwich Village, as well as performances at the “John Birks Gillespie Auditorium” located in the “Baha’i Center” in NYC , also at “Trumpets” and a regular attraction at St Peter’s Mid Day Jazz series along with concerts at Hofstra and Montclair Universities. The band has two CD’s out (Urban Still Life & Not So Big Band) that have enjoyed considerable airplay and both have been very well received. by the jazz press A third CD (UH OH!) will be released in 2016. 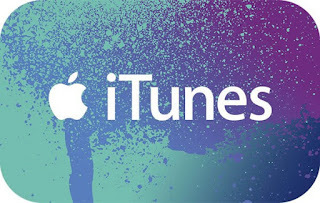 All of our music is currently available from most digital vendors like iTunes CDbaby and through streaming services, such as Spotify. 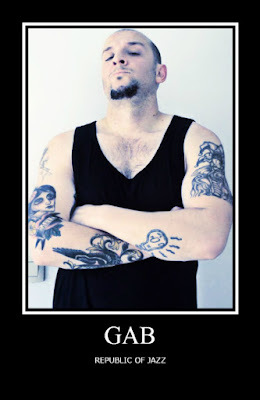 Lou Caputo, a native of Williamsburg, Brooklyn, has done almost every kind of job that a musician can be asked to do. 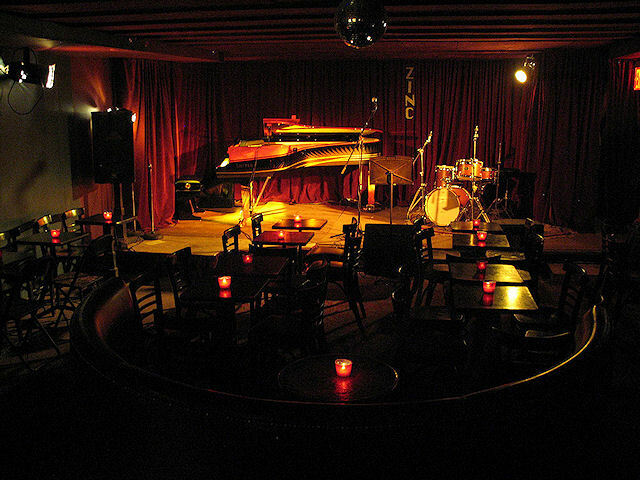 He has performed in jazz clubs in London (Ronnie Scott’s) and all over the Northeast area as well. A multi-instrumentalist (saxophones, clarinets and flutes) he has performed in show bands with the likes of Lou Rawls, Harry Connick Jr, The Temptations, The Four Tops and Shirley Bassey. 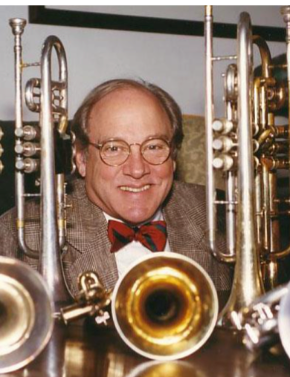 He has also performed with Howard Johnson’s five Bari Saxophone group (Beartones) as well as Warren Smith’s Composers Orchestra and The Ellington and Dorsey bands. He is a member of Jack Jeffers New York Classics and has performed with The Cotton Club Orchestra Recently Lou performed on Harry Connick's album "Your Songs"
Also featured in “The Not So Big Band” are noted musicians like percussionist Eddie Montalvo (Grammy nominee, Latin Grammy winner, Fania All-Stars), saxophonist Virginia Mayhew (Saxophone Journal Saxophonist of the Year), trumpeter John Eckart (Performed with Toshiko Akiyoshi and Lee Konitz), legendary bassist and jazz author Bill Crow (performed with Gerry Mulligan and Phil Woods), Geoffery Burke (performs with Harry Connick Jr.) Warren Smith who has performed with everyone from John Cage and Gil Evans to Barbra Streisand and all stops in between Just to cite some of the band members. 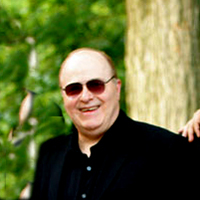 Lou Caputo, a natine of Williamsburg, Brooklyn, has been a professional musician for over thirty years. 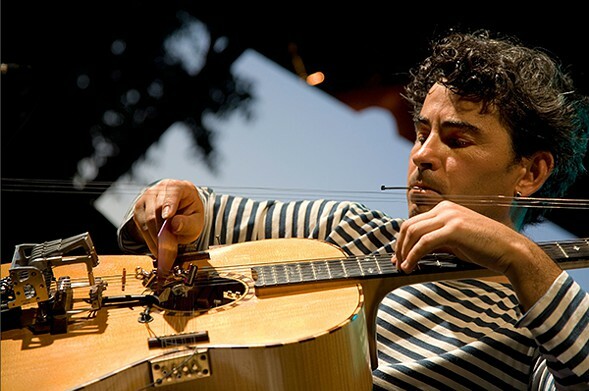 He has done almost every kind of job that a musician can be asked to do. A multi-instrumentalist (saxophones, clarinets and flutes) he has performed in show bands with the likes of Lou Rawls, Frankie Valli, Shirley Basey, Jack Jones, Bobby Short, Frankie Avalon, and a host of others. As well as the many of the famous Motown acts like the Temptations and the Four Tops. Aside from this he has performed along side of Salsa legends like Candido, Bobby Sanabria and Lou Perez. 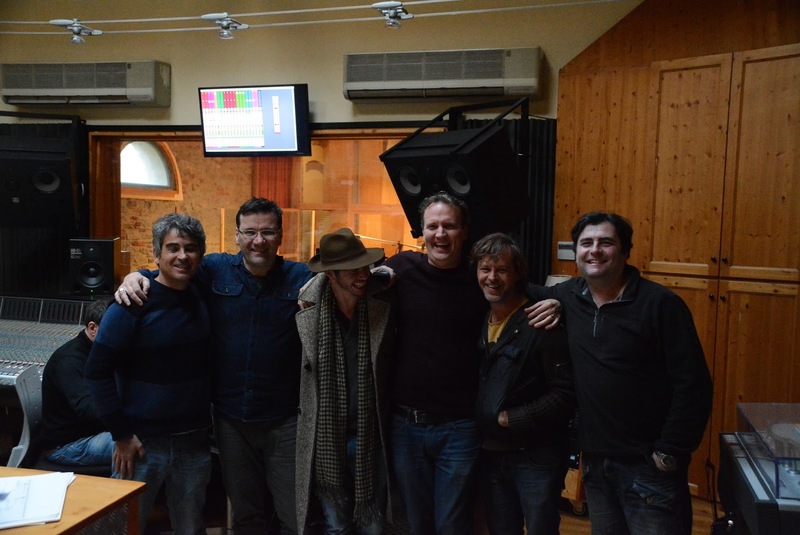 Recently he has performed on Harry Connick's latest album "Your Songs". 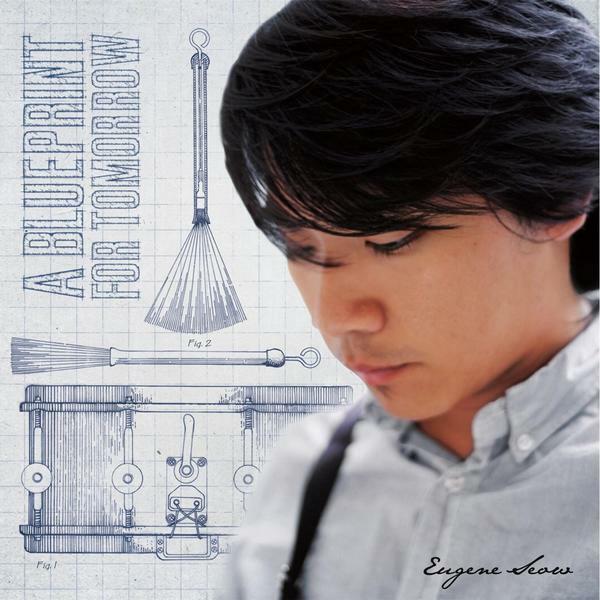 An impressive debut album by professional musician Eugene Seow (Singapore), "A Blueprint for Tomorrow" features young lions in the jazz world from all corners of the globe. The members of this group are: vocalist Ester Wiesnerová (Slovakia), clarinetist David Ling (Malaysia), flutist and saxophonist Brandon Wilkins (USA), guitarist Julian Jayme (Canada), pianist Jimin Park (S. Korea) and bassist James Heazlewood Dale (Australia). Eugene himself is on the drums, cajon and auxiliary percussion. All compositions on the album are his. 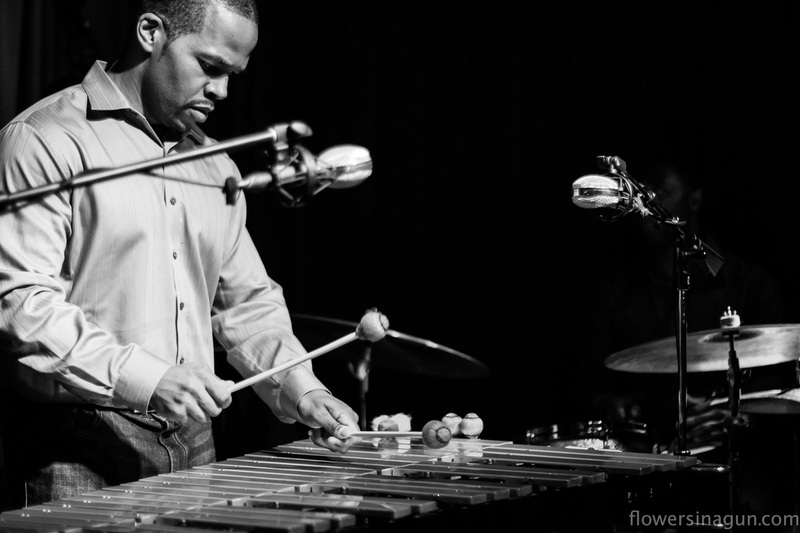 Eugene has completed his musical studies at Berklee College of Music, majoring in Jazz Composition and Professional Music, with a Minor in Music and Society (Global Studies). 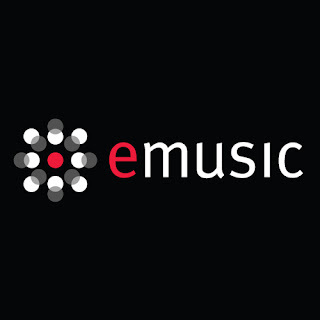 Prominently featured in Jazz Composition concerts such as “The Best of Jazz Composition” and winner of prestigious awards from all the departments he is involved in, Eugene hopes to go into academia in the future, which is supplemented by his background as a music tutor in music college as well as his disposition as an intellectual thinker. He is now stepping into the professional realm with this album, which is an ambitious capstone project for his Professional Music major that goes far beyond the requirements of a college level final. Embarking on his musical journey at the tender age of 6, Eugene studied classical piano. 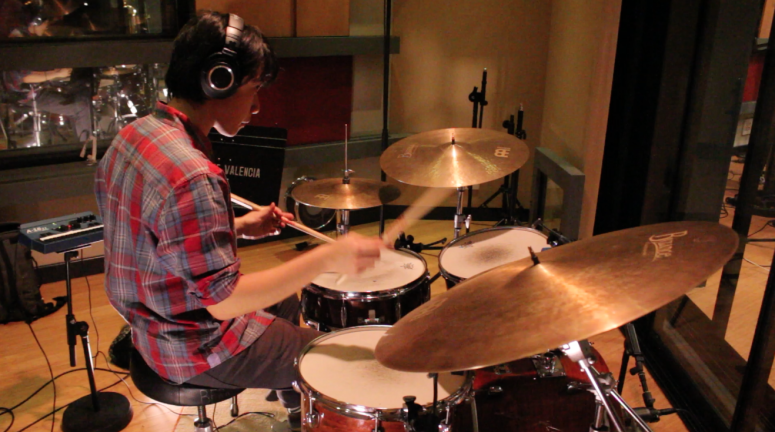 Showing an innate talent and instinct for music, he has honed his musicality over the years deeply, and found his true passion for the drums at 17 years of age. Thereafter, he discovered his other true passion: that for jazz. Since then, he has been actively performing and gigging in the scene and has become a force to reckon with despite his late start on the drum-set and relatively young age. 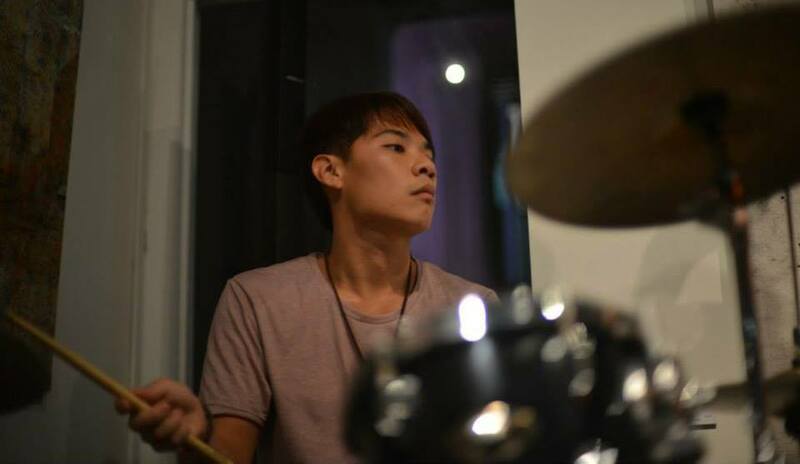 A multi-instrumentalist who plays percussion, electric bass and piano among others, Eugene is a practically self-taught musician who has learned through the school of hard knocks; that is, real world experience. He has incredible versatility whether the music is pop, rock or jazz, and in any ensemble whether it be big band, combo band, symphonic band, orchestra or even marching band. We will cut to the chase. Yes, you need to have your own personal copy. Yes, you will place it right next to Marley, Prince, Monk, Return to Forever, Biggie, Tupac, James Brown, Hendrix, Holst, Mighty Sparrow, Weather Report, Miles, Earth Wind and Fire. Yep, we’re talking game changer. We are a sum of our experiences. At least musically speaking - so they say. 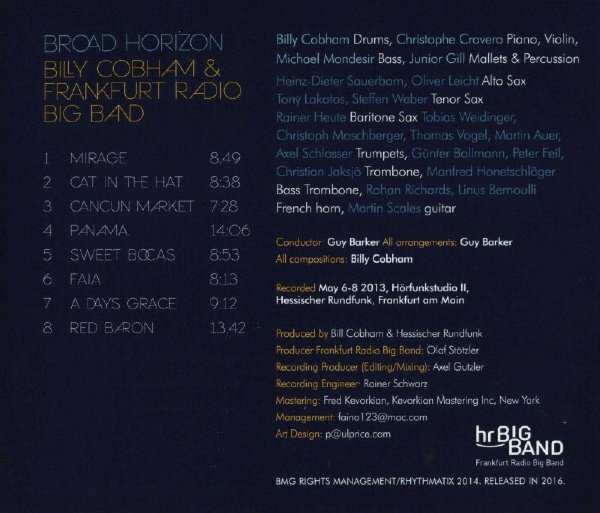 And if this is true (and we definitely believe it to be so) - wait till you listen to “Broad Horizon” by drummer extraordinaire Billy Cobham - featuring Cobham and Frankfurt Radio Big Band. Simply outstanding. It’s going to leave you shaking your head and muttering - man-o man-o man-o Man! in complete enjoyment and ecstasy. 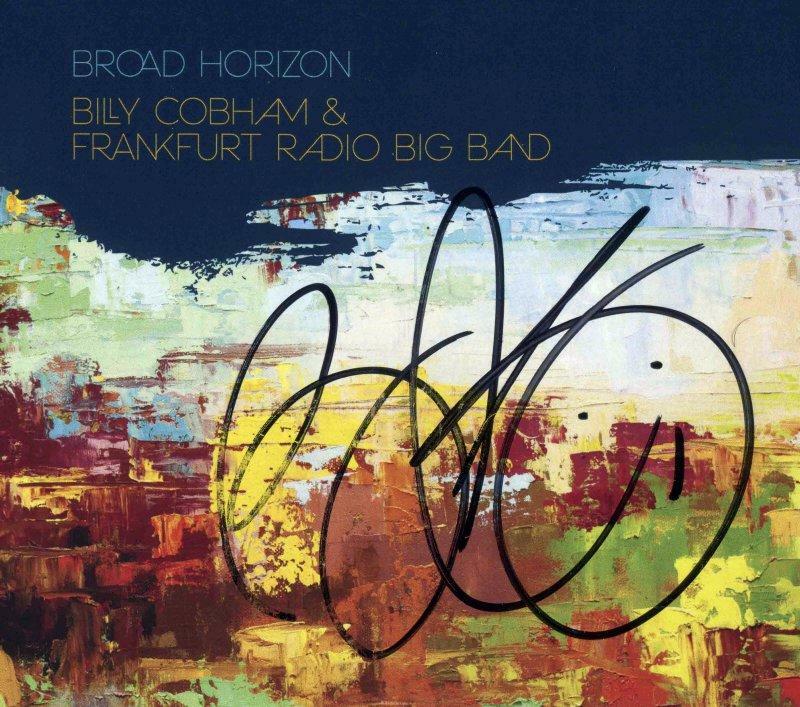 The Frankfurt Radio Big Band is outstanding and Billy Cobham remains the master that he is. 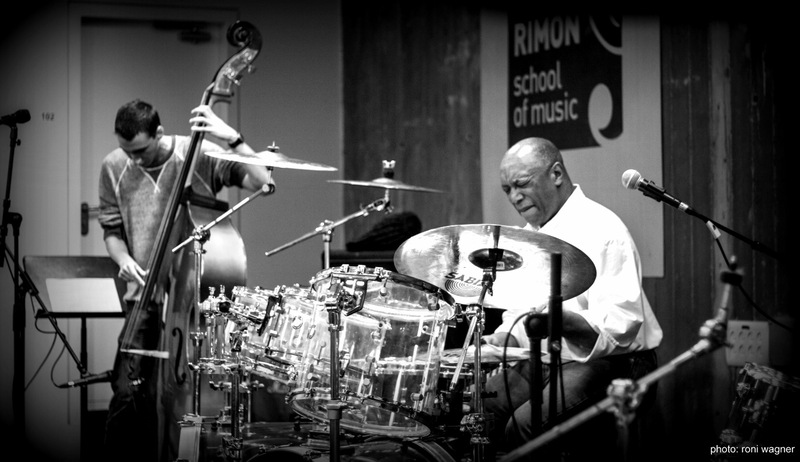 It has been a few years since our last review of Billy Cobham’s project -- “Culturemix.” “Broad Horizon” was well worth the wait. 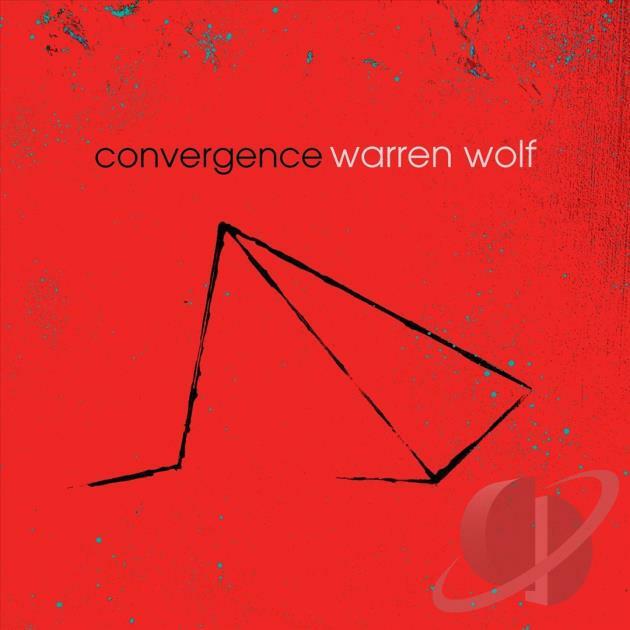 For years, I have known a certain truth-- don't sleep on Warren Wolf. 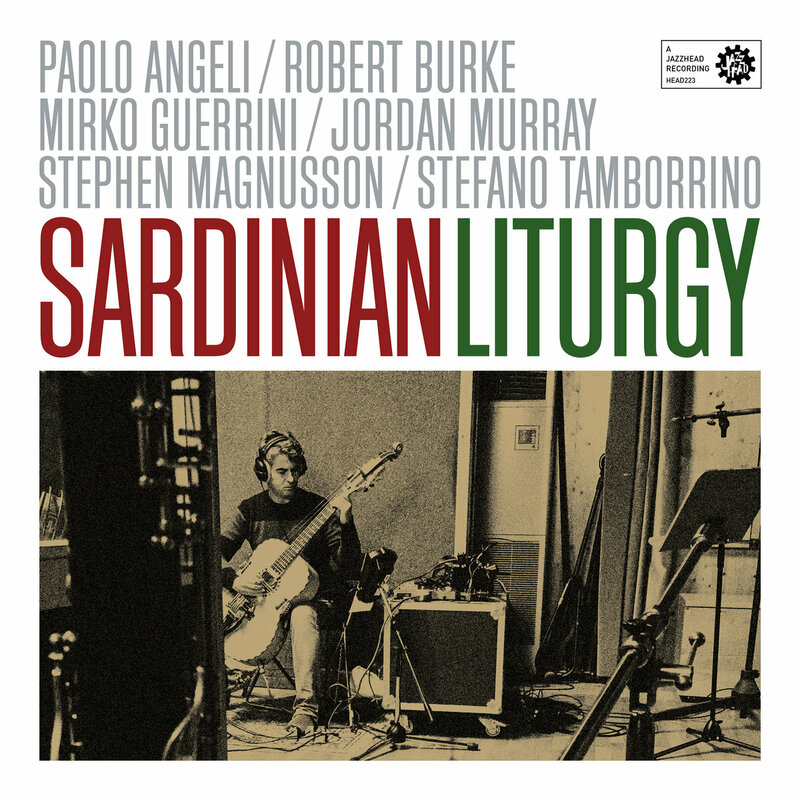 the master vibraphonist has snuck up on me one too many times on releases of his own. He rolled through San Antonio three times in 2015 and never failed to impress. His work with Christian Scott aTunde Adjuah's large ensemble is a surprise and not a surprise at the same time. He has maintained a beautiful melodicism in his playing that would seem obvious for his instrument but he surpasses such expectations again and again. He's an unmistakable talent. He shouldn't be slept on. 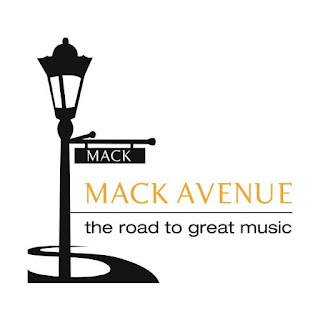 This is no more apparent than in his latest album, Convergence on Mack Avenue. It's 1:55 into "Cell Phone" when Wolf literally quotes the classic Nokia ringtone where one realizes how much one shouldn't sleep on this kind of wit, cleverness, and sense of connection that his style of play just oozes. Of course, one could say the same thing about his take on Bobby Hutcherson's "Montara", just a sweet as the original and just as inspired in its simple trio format. One could also know this for sure by album closer, a sweet, solo of the standard "Stardust" as he transitions it to Chopin's "The Minute Waltz', a song so clever it's impossible not to stay woke. Surely this band isn't sleeping on him-- Christian McBride on bass, Jeff "Tain" Watts on drums, with Brad Mehldau playing piano throughout half the album and John Scofield playing guitar on a couple of tracks. It's a band with complimentary chops-- McBride showing bounce and spring, Watts with a snap that always makes its presence felt. As a core trio, these men are quite effective and emotive, able to bring Wolf's soulful sound to its rightful stage. He can be sweet and he can be sharp and McBride and Watts are there for every move. However, it's the flourishes only Mehldau can provide where this album really sings, particularly when Wolf and Mehldau are playing off one another. Mehldau has always had sprightly moments, particularly when he's collaborating outside his usual circles. This is one of high points of his occasional canoodling. 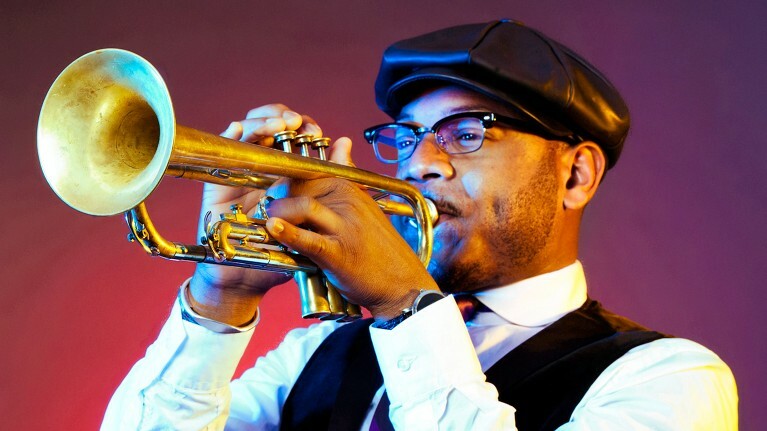 Composer, arranger, recording artist and educator Etienne Charles is one of the most compelling and exciting young jazz artists on the scene, ushering the genre into groundbreaking new territory. The young trumpeter and bandleader performs the world premiere of his San Jose Suite, borne of influences from San Jose, CA; San Jose, Costa Rica; and Charles’ native St. Joseph, Trinidad. 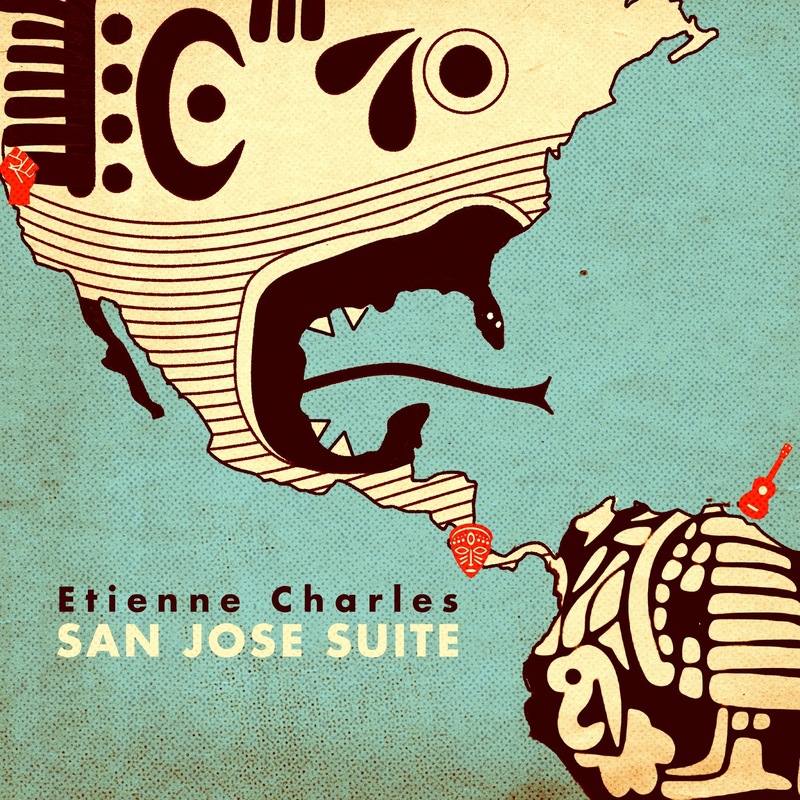 The San Jose Suite explores stories, rituals, native chants, rhythms, and other cultural elements that shaped the three San Jose cities. This musical exploration will take place through a mix of composition and improvisation, with each movement of the 60‐75 minute piece introducing cultural and historical icons, traditions, and milestone events in the history of the cities. Charles is known to deliver a unique spin on Creole-oriented tunes, including covers from past masters ranging from Bob Marley to Thelonious Monk. His latest album Creole Soul is a captivating journey of new jazz expression, formed from his Trinidadian background. 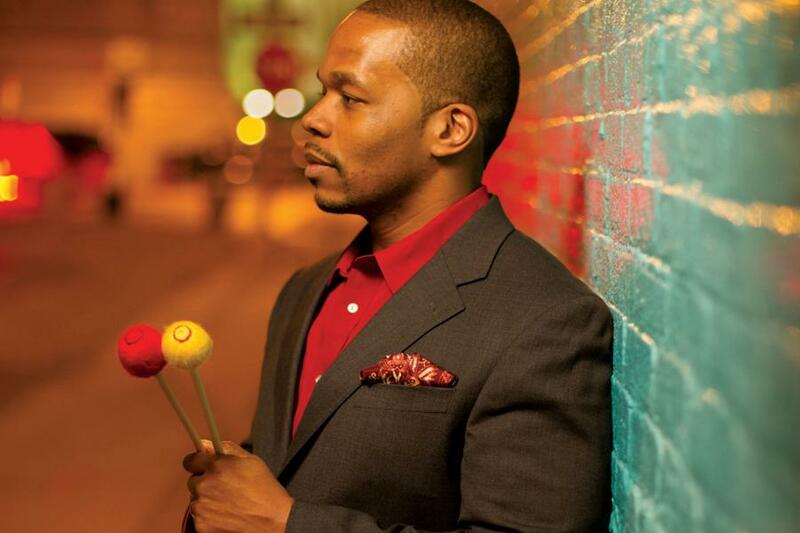 Charles has also performed with a vast range of musicians, from Roberta Flack, Rene Marie, and David Rudder to Wynton Marsalis, Johnny Mandel, and the Count Basie Orchestra, in addition to his work as Assistant Professor of Jazz Studies at Michigan State University.